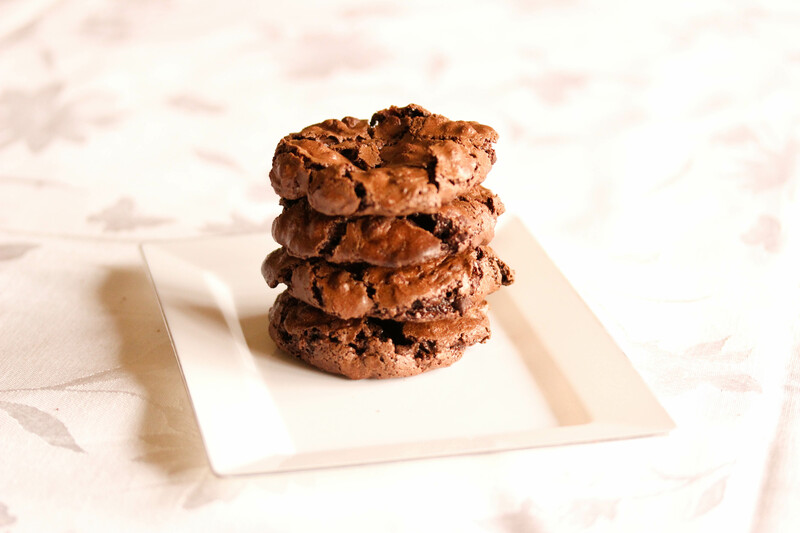 Flourless Chocolate Cookies are like little clouds made of chocolate! Have you ever wondered what life would be like if clouds were made of chocolate? You haven’t? I guess you aren’t baking obsessed. Like me. The answer? Well, for starters, rain storms would be a whole lot more fun, wouldn’t they? If I’ve gotten you curious about chocolate clouds, and you totally want to experience them, well here’s your chance. These cookies aren’t going to rain any time soon which is totally a shame but when you bite into a fresh hot cookie you’ll feel what a chocolate cloud is like. I’ve had my eye on various versions of this recipe for ages, and because they are flourless, I decided that Passover is a good time to give their decadence a try. If you don’t need another Passover cookie, or don’t observe Passover, and don’t have any gluten free friends to bake flourless cookies, make these anyway. They’re perfect little clouds of chocolate-y goodness. In a mixing bowl, stir together the confectioners sugar and cocoa. Add two egg whites and the coffee. Stir until combined. Batter should be like a very thick brownie batter. If batter is too thick, add another 1 (or if needed 2) egg whites to achieve the correct consistency. Gently stir in the chocolate chips. Place 1 inch mounds (or balls) of dough about two inches apart on prepared cookie sheet. Bake at 350 for 13-14 minutes, until tops are crackly. Leave cookies on parchment paper to cool completely, then gently peel off the parchment and serve. 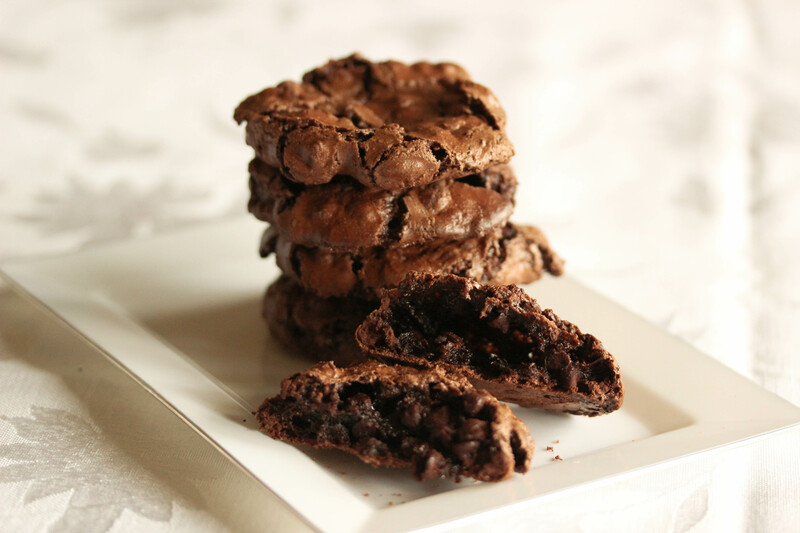 Loved your intro to these cookies and the cookies themselves look delicious! I will make it a priority to make these cookies this week. I actually have several like these pinned but they have nuts instead of the chocolate chips and my son does not like nuts in cookies. He will love these. Thanks! Oh lovely! I think that flourless chocolate things are the best because they are often so much richer. These look amazing! Hi, this looks like a good recipe I can make for a friend of mine who doesn’t eat gluten. Do you have to beat the egg whites before, or can do just toss ’em in as is? Thanks! Just took these cookies out of the oven…. what shall i say?! U described them to the point!! It makes about 3-4 dozen. Do you have a sugar free recipe? Good, but so sweet, not even my son could eat a whole cookie! We put them in the freezer, and will use chunks of them as topping next time we are having vanilla ice cream. This post is included in the Quick Passover Kosher Cooking Carnival. Please, take a look, comment and share, thanks. Do these freeze well? Also, do the egg whites need to be whipped or just mixed? Looks delicious. I will definitely make these this year! Thanks.